It’s been a few weeks since I completed The Caddie Who Knew Ben Hogan, a novel by John Coyne. Coyne is the author of more than 20 books, most of them horror novels, and a few of them golf books. I admit I was skeptical when I began reading John’s story set at the Midlothian Country Club in south Chicago, a real place where John caddied during his teens. How would I feel about the legendary Ben Hogan in a fictional account? It worked, and not just because Coyne is a gifted storyteller. 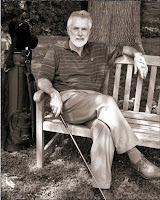 John knows his subjects – golf, country club life in the 1940s, caddieing and Ben Hogan. To find out more, visit his site. Last week John answered my questions about Hogan, Tiger Woods and other golf topics. Armchair Golf: What do you think is important for golf fans in the Tiger Woods era to know about Ben Hogan? John Coyne: Well, the most important thing is that there were other great players. Golf didn’t begin with Tiger! Tiger knows that. In fact, in the last years of Hogan’s life, Tiger called up Hogan, and Hogan back then — this was the late 90s — had seen Woods playing on television. Also, everyone in the golfing world knew these were Hogan’s last years and they were paying their respect. Tiger was paying his respect to one of the men who made professional golf a worthy and wealthy career. Armchair Golf: What parallels do you see between Ben Hogan and Tiger Woods? John Coyne: There are several. Their desire and need to win. They both shared the same ability to come back from defeat to victory. Their respect for golf’s history, and this was a small, but important aspect, the presentation of the winning trophy. Hogan, for example, would always have his dress clothes in the locker so that if he won, he would look like a champion. You see that same respectfulness from Tiger. But perhaps what is important is the way they continue to work at their game. Here Tiger is at the top of his game and he goes out and reinvents his swing. Until he could no longer play, Hogan was always working on his swing, as well as, working on making the perfect club. Armchair Golf: Can you provide a snapshot of what golf was like in the 1940s? John Coyne: My novel is set in the summer of 1946, the year Hogan won his first major. Hogan and all the pros were just getting out of the army. Nelson, McSpaden, Ed Dudley, Harry Cooper, Joe Kirkwood, Gene Sarazen, and a few other pros never were in the army, so there wasn’t much competition during the war years in the few events that were staged. Nelson, however, made the point in a 2006 interview with Golf Magazine that in ’45 when he won 11 straight that Ben Hogan played in 18 events that year, and Snead played in 26 tournaments. And at the PGA Championship, which was then match play, Nelson beat Gene Sarazen, Mike Tunesa, Denny Shute and Claude Harmon. By the end of war, there were only about a dozen pros who did nothing but play in tournaments. They weren’t home pros. Most of the pros made a living as home pros. There just wasn’t enough money in the way of prizes to keep a pro playing all the time. Armchair Golf: Why was that? John Coyne: The big problem for the touring players was that the home pros of the PGA controlled the tournaments, prizes, and everything else, and the touring pros felt that they couldn’t make a living just playing golf. The only real money in terms of a golf event was the one sponsored by George S. May. He put on the All-American Open first in 1941. He also had amateur championships for men and women at his Tam O’Shanter Country Club in the northwest suburban of Chicago. He also had an invitational championship for a dozen pros with a winner-take-all purse of $10,000. So there weren’t many pros playing full time nor was there much money. Also, according to the PGA, in 1946 — the summer of this novel — there were only about four thousand golf courses in the U.S. and about two and half million players. Armchair Golf: As a novelist, you’ve said that story characters take on a life of their own. As you researched Hogan and then placed him in a fictional setting, did anything about him in real life or how he emerged in your book surprise you? John Coyne: Yes, the affection Hogan had for children, young caddies, his niece. Valerie and Ben did not have children. My guess is that they couldn’t imagine having children and devoting their lives to the tour. Playing the tour in those early years was a tough job. No private jets. No campers. Hogan, in his later years, took an interest in the caddies at Shady Oaks, took an interest, too, in young pros trying to make it on tour. So, it wasn’t much of a creative stretch to think of Hogan befriending a young caddie and sharing with him his [Hogan’s] philosophy of life. Armchair Golf: Did you ever have any encounters with Ben Hogan? John Coyne: No, my connection with Hogan was as a fan and knowing pros that played with Hogan. Both Jimmy Walkup, the pro at Midlothian Country Club south of Chicago, and Tony Holquin, the assistant pro, who then became the head pro, were from Texas and had played with Hogan. Later in life I came to know Jules Alexander — he did the photos for a golf instructional book I did with pros from the senior tour entitled Playing With the Pros — and he has a wonderful collection of Hogan photos, as well as stories about Hogan. Also, I got to know Harry Cooper in the last years of his life. Harry lived to be a hundred, and had been a pro from Texas who knew Hogan. And all of them had their own stories about meeting the Hawk. Armchair Golf: Can you share a personal caddie story that was particularly memorable for you? John Coyne: One small item comes to mind. In my novel, on page 252, I have young Jack checking the golf balls with a small ring. We would do that as caddies back in the forties and fifties because golf balls weren’t as well made as they are today, and might be banged out of shape. Also, the course I had them play, where Jack caddies, is the course where I worked, and I used those holes as my course, as well as, the design of the clubhouse. Armchair Golf: As a former caddie and longtime student of the game, what life lessons has golf taught you? After all these years, I am not so sure of all my comparisons between golf and life. But I do still believe if you live your life like you play golf, from the back tee and without any mulligans, you can stand taller and look anyone in the eyes. That’s good advice for anyone. Nice interview. I'll have to check out the book. Great stuff! Very nice read! Tom, Sean: Thanks! I'm glad you enjoyed it. I will have more material from John Coyne in the near future, including a preview of his next golf book. Please contact me regarding the Lion at the Guenet Hotel story. My dad USAF Lt Col W J Gary, first Air Attache to Haile Selassie, bought (1958) and raised that lion named "Simba". in our home! The part shepherd was named "Kitch" and we lived near the bottom of Roosevelt St off Mexico square down from the tobacco factory, near the creek. The pair was left w/owner and friend of Guenet in a much larger "run" or large pen. I have the story of how it became a horrible cage. We returned to Addis in 2003 to see for ourselves. I have lots of photos and Christmas Cards with the pair posed along with the family! Interesting story...I have the correct version involving the Ambassador's wife. Will Mickelson Be Next FedEx Cup Defector?